March is still a few months away but St. Patty’s Day is coming to Chicago. Hidden Shamrock, Lincoln Park’s oldest Irish pub will be celebrating halfway to St. Patrick’s Day on Saturday September 14. Hidden Shamrock, known for their fresh and never frozen upscale bar menu, will be offering food and drink specials as well as live music. From 1-5p.m. guests can participate in a $40 party package that includes a food buffet, Miller Lite and Coors Light drafts and well cocktails. During this time Chicago based band Katie Kadan and The Rockwells will be playing live music. All day specials will include traditional Irish drinks including $6 Irish Car Bombs, $5 Jameson shots, and $5 Guinness. 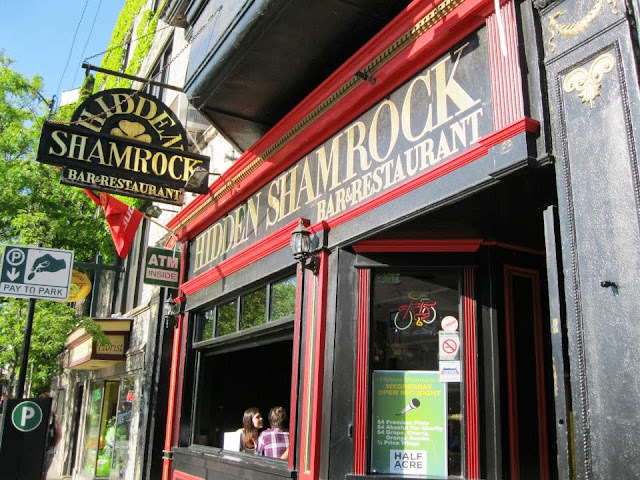 Monday – Friday: 5 p.m. – 2 a.m.
Saturday: 12 p.m. – 3 a.m.
Sunday: 12 p.m. – 2 a.m.
Hidden Shamrock, Lincoln Park’s oldest Irish Pub, has been serving up delicious Irish pub fare since its conception in 1987. Originally known as Chasen’s and later Pat O’Brien’s Hidden Shamrock now hosts trivia and open mic nights and is known for their gourmet bar menu, craft beer selection and specialty cocktails. Hidden Shamrock is the perfect place to watch a game, host your next party or simply enjoy a burger and pint with friends. Bad Dog Tavern is Chicago’s official home for Tennessee Volunteers football and is also the perfect place to cheer on the New York Giants and the Chicago Bears this fall. Tennessee fans will enjoy game day specials including $5 20oz Jack Daniels drinks and $4 20oz Miller and Bud Light Drafts both served in Tennessee stadium cups. Giants fan will be treated to $4 20oz Miller and Bud Light drafts in Giants stadium cups on Sundays. Saturday and Sunday game day specials include $4 jameson shots and $15 Domestic bottle buckets. Brunch will be served Saturday and Sunday from 11 a.m.-2:30 p.m. HOURS: Monday- Thursday: 11 a.m.- 2 a.m. | Friday- Saturday: 11 a.m.- 3 a.m. | Sunday: 11:30 a.m.- 2 a.m. Guests can cheer on the Monsters of the Midway at Brasserie by LM, the traditional French brasserie in Chicago’s Essex Inn located just down the street from Soldier Field. During home games and Monday night football, guests are invited to Bear Down with Brasserie’s $11 Croque & a Beer combo which includes a Miller Light and Croque Monsieur (a hot ham and cheese sandwich with bechamel, Dijon mustard served with brasserie potatoes). Photo available upon request. This football season, Chicago q, the city’s hottest spot for upscale barbecue, invites Chicagoans to enjoy a barbecue tailgate with classic dishes from the talented hands of award-winning Chef/Partner Lee Ann Whippen. The restaurant has created a special package perfect for tailgating at Soldier Field or cheering on the Monsters of the Midway at home. The Tailgater, $85, comes with Chef Whippen’s Award-Winning Kobe Brisket Chili with Italian sausage and ground beef, Smoked Dry-Rubbed Wings, House Bacon Cheddar Hush Puppies, Pig Powder Chips with Habanero Ranch, Smoked Sausage and Pickles. This package feeds 8 to 10 people. To place your order, contact Stephanie at 312.642.1160 or stephanie@chicagoqresturant.com. In addition, for guests visiting the restaurant, Chicago q features both a bar and upstairs lounge with televisions that are perfect for cheering on favorite teams. Clark Street Dog and Bar is the ideal place to grab a bite and a brew while watching the Chicago Bears this football season. Patrons can catch the game at Clark Street’s intimate bar and will be able to enjoy their signature Pickle-Back Shots for $5 and Goose Island beers on tap for $3.50. Additionally, Clark Street Dog will be serving up their always fresh and never frozen menu. Highlights include the signature Clark Street Dog, $3.29, Chicago’s Best Philly Steak Sandwich, $7.69, Original Style Gyros, $6.29, and Italian Beef, $6.19. Hidden Shamrock, Lincoln Park’s oldest Irish pub, is Chicago’s home for New England Patriots and Miami Hurricanes football. For ‘Canes game days, Hidden Shamrock offers a $30 Well Drinks and Domestics special, $15 pitchers of PK3, Hurricanes and Moose Juice, and $4 Jameson shots. Additionally, all patrons receive a free raffle ticket and are eligible to win exciting prizes like hats, shirts, back packs and concert tickets! New England Patriots’ and Chicago Bears specials include $6 pitchers of PBR and Coors Light and $12 Sam Adams Pitchers. In addition, the bar offers classic Miami football food specials such as chicken chop chop, chicken nachos and Miami supreme ‘za. Merkle’s is Chicago’s home for Iowa Hawkeyes and Chicago Bears football. For all Hawkeyes games fans can enjoy $5 Absolute Drinks and Bombs and $4 Jameson shots and 22 oz Miller and Coors Light Drafts. Merkle’s is also the perfect place to cheer for the Chicago Bears this season. They offer a All You Can Eat Bears Brunch for $10.99 along with a $5 Build Your Own Bloody Mary and Mimosa bar. Other Bears game day specials include $15 Miller and Coors Light Buckets, $5 Bombs and 22 oz Miller and Coors Light Drafts for $4. HOURS: Monday- Friday: 5 p.m. – 2 a.m. | Saturday: 11 a.m. – 3 a.m. | Sunday: 11 a.m. – 2 a.m. Weather Mark Tavern, located minutes away from Soldier Field, invites Chicago Bears fans to relax with $4 22 oz domestic drafts during every Bears game. Game goers can valet and grab a drink before walking over to the stadium or stop by after the game for dinner. Other fans can watch from the comfort of the nautically themed restaurant and bar on one of their many flat screen televisions. Football fans are invited to watch Monday night football games at Carlucci’s in Downers Grove. Guests can enjoy $3-$5 appetizers in the bar area. Appetizer options include classic pepperoni pizza, homemade meatball slides, cripsy calamari and bocci ball arancini (two breaded fried risotto balls with fresh mozzarella, mecorino, peas and tomato sauce) and more. The bar also features an extensive list of domestic beers, craft beers and signature cocktails. Full food and drink menu available upon request. Hidden Shamrock, Lincoln Park’s oldest Irish pub, is pleased to unveil their new and improved menu available for dinner and weekend lunch. The new menu focuses on upscale bar food giving a modern flair to the traditional Irish pub fare. All items are handmade daily from fresh, never frozen, ingredients. The new menu was designed to make patrons feel at home by offering a wide range of gourmet bar food, craft beers and specialty cocktails. Highlights from the newly conceived menu include Homemade Tater Tots, $4.95, served with a Cajun mayo, Homemade Baked Mac n’ Cheese, $11.95, cavatappi pasta paired with bacon and gruyere cheese sauce and topped with sourdough bread crumbs, Fish n’ Chips, $10.95, beer-battered Atlantic cod, served with hand-cut French fries and tartar sauce, and Homemade Shepherd’s Pie, $10.95, with ground beef and pork, carrots, peas, and onions in gravy and topped with whipped potatoes and cheddar cheese. Homemade flat bread dough, topped with choice of sauce and fresh mozzarella. Saturday, August 31 – Sunday, September 1: 10 – 2 a.m.
Monday, September 2: 11 a.m. – 10:00 p.m. This Labor Day weekend, Chicago Cut Steakhouse offers guests an exceptional al fresco dining experience along the historic Chicago River with a spectacular view of the city. The restaurant’s full menu is available outdoors for breakfast, brunch, lunch and dinner and features 100% Prime USDA beef. The patio seats 80 and features a cocktail lounge with an unrivaled wine list available via iPad. In addition Chicago q invites Chicagoans to take the day off this Labor Day and enjoy classic barbecue dishes at the talented hands of Chef Whippen with their catering and delivery services. Items available for catering and delivery include House Bacon Cheddar Hush Puppies, BBq Shrimp with Herb-Infused Grits, and BBq Cobb Salad for starters. Lee Ann Whippen’s award-winning barbecue options include a Whole Pork Shoulder (catering), Kobe Brisket, and Baby Back Ribs. Not to be served solo; available sides include Kobe Brisket Baked Beans, Bruléed Mac n Cheese, and Braised Greens. Catering menu and pricing are available at www.diningin.com. Saturday, August 31 – Sunday, September 1: 10 – 4 a.m.
Monday, September 2: 9 – 3 a.m. Nothing says Labor Day like hot dogs and hamburgers from Lakeview’s favorite hot dog joint, Clark Street Dog. The restaurant, recognized by Urbanspoon as one of the cities five best hot dog spots, has been serving up hot dogs, hamburgers, gyros, Italian beef and sausage, chicken sandwiches, salads and more for over 36 years. 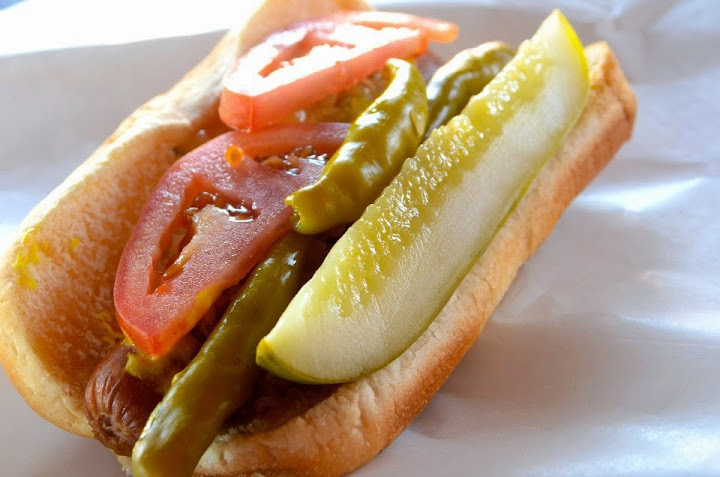 Known for their signature Clark Street Dog, a play on the traditional Chicago Dog with mustard, onion, relish, tomato, pickle and sport peppers, Clark Street Dog and Bar boasts the perfect mix of late night entertainment and delicious food. This Labor Day weekend, in addition to their always fresh and never frozen menu, they’ll be serving up their signature Pickle-Back Shots for $5 and Goose Island beers on tap for $3.50. 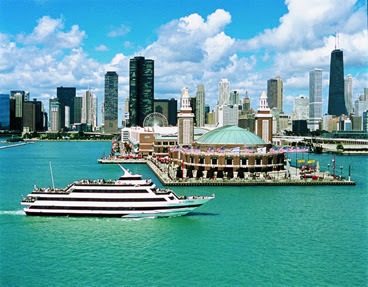 Chicagoans are invited to step aboard the cool Mystic Blue, festive Spirit of Chicago and elegant Odyssey cruise ships for Labor Day on Sunday, September 1 and Monday, September 2. Guests will enjoy plated or buffet dining, DJ entertainment and amazing skyline views. All prices below are per person and do not yet include taxes and other fees. Dates and times are subject to change. Complete menus, photos and further details are available upon request. Board: 6:30 p.m., Cruise: 7 p.m. – 10 p.m.
RESERVE: Reservations are required and can be made by calling 888.957.2320 or by visiting www.odyssey.com. RESERVE: Reservations are required and can be made by calling 888.957.2324 or visiting www.spiritofchicago.com. Board: 12 p.m., Cruise: 12:30 p.m. – 2:30 p.m.
RESERVE: Reservations are required and can be made by calling 888.333.9150 or by visitingwww.mysticbluecruises.com. Saturday, August 31: 12 p.m. – 3 a.m.
Sunday, September 1: 12 p.m. – 2 a.m.
Monday, September 2: 5 p.m. – 2 a.m. This Labor Day weekend Hidden Shamrock, Lincoln Park’s oldest Irish pub, will be celebrating with burger and beer specials. The Burger and Fries, available for $5, features a handmade patty of 100% grade angus beef, served on a toasted pretzel bun and accompanied by Hidden Shamrock’s hand-cut french fries. Domestic Buckets are also available for $14. Saturday, August 31: 9:30 a.m. – 3 a.m.
Sunday, September 1: 9:30 a.m. – 2 a.m.
Monday, September 2: 11 a.m. – 2 a.m.
Riverview Tavern is the perfect place to dine and drink this Labor Day weekend. Patrons will be able to start their day off right with Saturday and Sunday brunch, served from 10:30 a.m. – 2:30 p.m. Well Drinks and the Craft Beer of the Month are available for $4 and Bombs are available for $5. On Sunday $5 Mimosas will also be served. Kids eat free on Monday from 4:30 – 6 p.m. and the whole family can enjoy buy 1 get 1 free pizza and ½ off bottles of wine. Weather Mark Tavern invites Chicagoans to relax this Labor Day and enjoy brunch at their south loop location. The brunch is cost effective and great for groups who can indulge in bottomless mimosa’s ($13.95 with purchase of an entree) and $5 SKYY Vodka Bloody Marys and Screwdrivers. Brunch goers can enjoy classic dishes including Traditional Eggs Benedict; $8.50, Buttermilk Pancakes or French Toast; $7.95, Huevoes Rancheros; $7.95 and made to order skillets; $9.95. More unique options include the Caprese Eggs Benedict; $8.95, Weather MarCristo (sausage patty inside two Belgium waffles, syrup battered and fried; $9.95) and The First Mate’s Burrito (scrambled eggs, peppers, onions, house potatoes and sausage wrapped in a whole wheat tortilla and covered with chipotle cheese sauce; $11.95). Brunch is served every Saturday and Sunday from 10:30 a.m. – 3 p.m. Full menu available upon request.